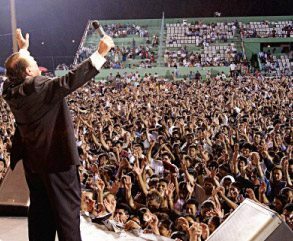 It was in 1962, in Porto Alegre, Brazil, that God asked Morris Cerullo, “What do you want from this life?” Morris responded by saying, “Give me the ability to take the anointing that You have placed on my life and transfer it to others.” God spoke to Morris that day in a clear and audible voice, “Son, build Me an army!” Since that time, Morris Cerullo has personally trained over FOUR MILLION foreign Nationals to take the saving and healing message of Jesus Christ to almost every nation on earth. God’s Victorious Army (“GVA”) was established to help fund the training of these Nationals. God’s Victorious Army members pledge to give $30 or more each month to help to support Morris Cerullo’s overseas ministries, including the training of Nationals. Click here to become a monthly God’s Victorious Army partner today! Begin your monthly commitment with as little as one dollar each day! The monthly Frontline News newsletter, with exciting reports and testimonies from the Nationals that you are training. A God’s Victorious Army Membership Card. This card entitles you to receive 50 percent OFF the cost of approved books and training materials at our seminars and conferences. Your monthly partnership gift to Morris Cerullo World Evangelism of $30 or more will build God’s Victorious Army around the globe!